When I started my job a few months ago, I quickly realised that if I was ever going to find the time to do things like eat, sleep and have any kind of a life in between work, the house and the animals, I would rapidly have to become a super-organised-domestic-ninja type person who can not only multi task but, ideally, one who can make it seem effortless at the same time ....... you know, like a swan, that glides along the lake serenely and effortlessly while paddling like billy-oh under the surface. So, I did the only thing I could think of at the time that might streamline the cooking process and I bought a slow cooker. The idea being that I could pop everything into the slow cooker before I went to work, during which it would bubble gently away and upon my return, I would be greeted by enticing aromas wafting from the kitchen. After much searching and after getting thoroughly tutted at by numerous annoyed staff members in various shops throughout Cornwall for opening boxes to see just how big a 5 ltr crock pot actually is, I managed to find one that was one-person sized. No mean feat let me tell you because the vast majority of them look like something you could quite comfortably bath a baby in! Most of them are, quite frankly, gigantic and not to put too fine a point on things, I probably couldn't afford to fill it with all the ingredients it would take to cook a meal of those gargantuan proportions, not to mention the fact I would be eating said meal for the better part of a week! My cute little slow cooker. 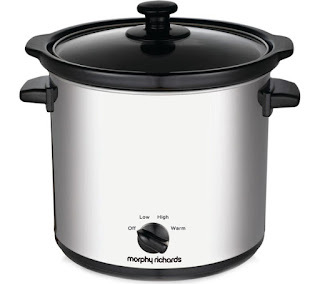 Anyway, dinky little crock pot acquired, I set about finding some delicious recipes to make in the expectation that this super cute little gadget would transform my life. This involved many, many happy hours searching Pinterest for delicious looking recipes for everything from chicken casserole to rice pudding and crock pot chocolate brownies ..... I kid you not! I couldn't wait to get started. I have made an amazing lamb tagine, a truly fantastic chicken soup and an absolutely delicious chilli with chunks of steak which were meltingly tender but, until now, I havn't tackled anything sweet. 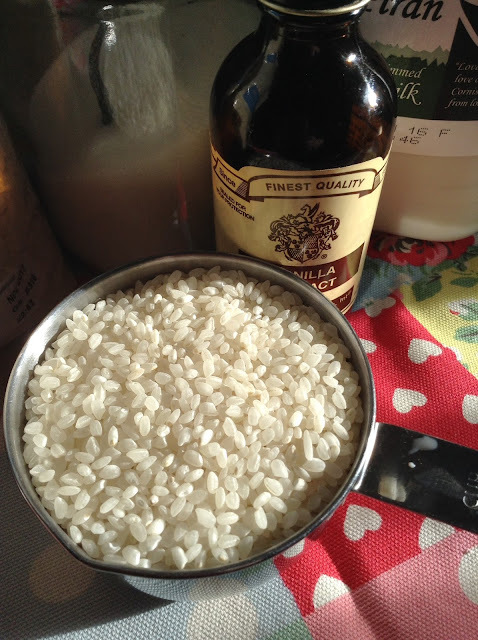 This morning, I decided that it was finally time to be brave and cook something different so I decided to make some rice pudding. 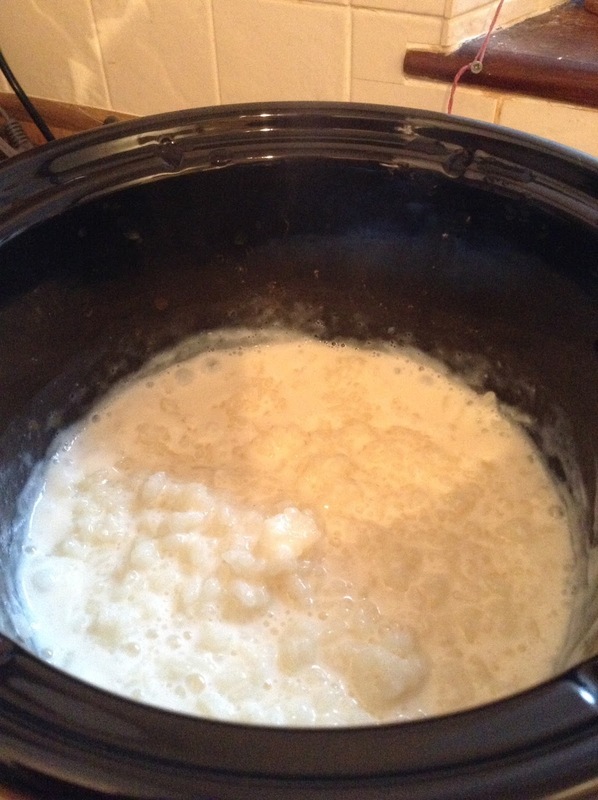 I put 1 cup of pudding rice, 4 cups of milk and half a cup of vanilla sugar with a little extra vanilla for depth of flavour, into the slow cooker and turned it on. I am now sitting waiting to see what happens. 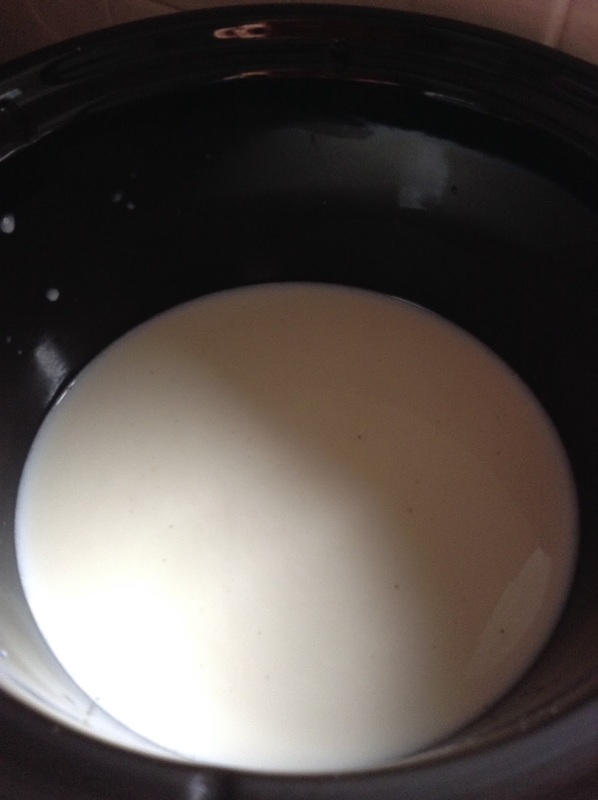 The flecks are little bits of vanilla from my home-made vanilla sugar. After 3 hours in the slow cooker, the rice is soft, the rice pudding is creamy and delicious, it didn't spill over the side of the pan like it usually does when I make rice pudding, leaving me with a sticky solid mess to chisel off both the pan and the oven and even though it was made with semi skimmed milk it tastes every bit as good as the full fat version. I will definitely be making this again. It looks to be good for sure. I have never heard of pudding rice (much less seen it on the shelf) but from the picture I can see that it is exceptionally short which would certainly affect the texture. Ooh what an interesting read, as I had a slow cooker for Christmas! 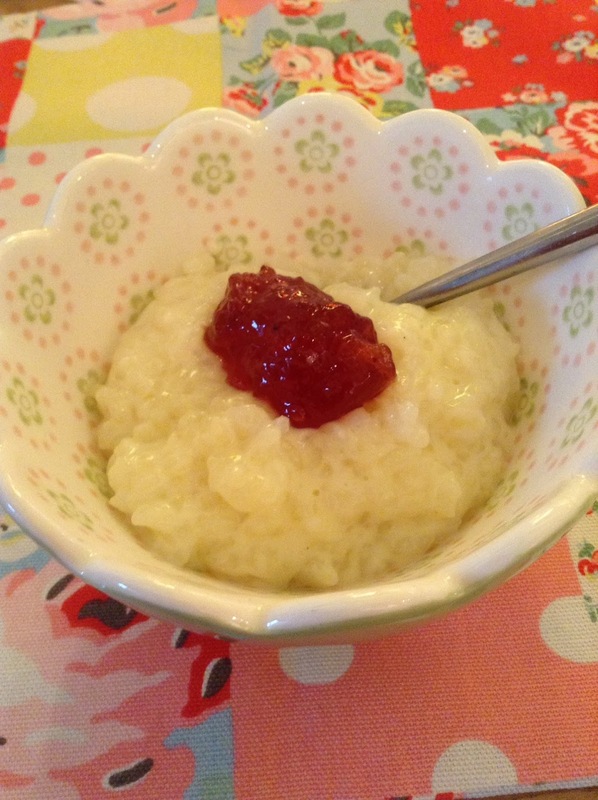 The rice pudding looks and sounds delicious and I will definitely give it a try, thank you. The tagine sounds wonderful too - and I hadn't thought of looking on Pinterest for recipes, what a good idea. The only thing I have cooked in mine was Chinese pork with plums from the Good Food website. It was a bit of a faff to do (too many ingredients!) but it made a very special dinner. Do keep us updated with anything else you try! 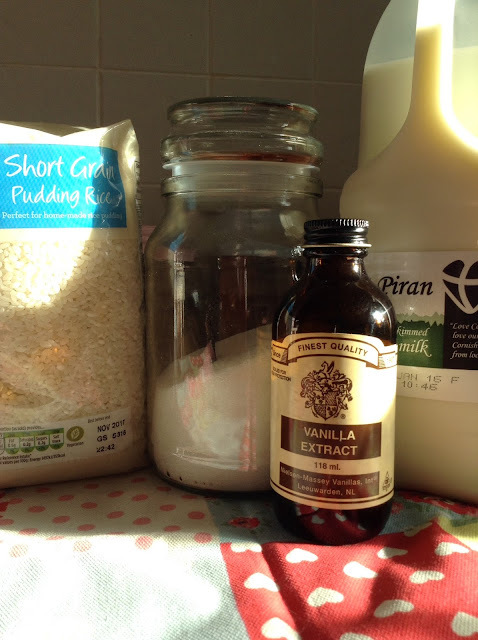 Mmmmmm, I'm now craving some home-made rice pudding. I think I might swap the slow-cooker from the cupboard with the mixer from the worktop. Great idea, thanks for sharing! I am so going to try this- perfect for a rainy Sunday!